When signing a lease, you pay a security deposit against any damages that may be incurred during your residence. The good news is that you may be able to get all of it back if you use these tips to plan ahead. Read your lease carefully. This should be a given, but it's particularly important concerning the security deposit since the lease specifies the amount, where the deposit will be held and an overview of what is and isn't allowed. Document the apartment's move-in condition. Make notes of anything that's questionable, no matter how small or insignificant it may seem, and take pictures. Conduct a walk-through with a member of the management team so you can both sign off on your checklist. Keep a copy of the inspection along with all photos in a safe, easily accessible place. Know the difference between damages and "normal wear and tear." The term has no specific legal definition, so the rule of thumb is any change that results from everyday living as opposed to neglect or abuse. When in doubt, err on the conservative side. Keep it clean. You don't have to be obsessively neat, but maintain your apartment in a reasonably tidy condition. Handle repairs promptly before they become unmanageable. Our maintenance team has a 24/7 phone line so they can be notified in case of emergency. Our Springs communities are pet-friendly, but dogs and cats have to observe the lease also. Take good care of your pets so they don't leave any permanent "souvenirs" of their stay. Once you've submitted your notice, allow plenty of time to return the apartment to move-in condition. Give it a thorough cleaning and don't forget the appliances. Conduct another walk-through with a member of the management team, once again documenting the apartment's condition in writing and photos. 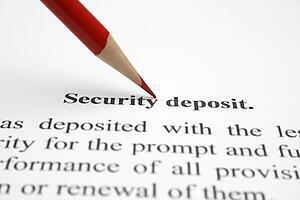 Each state has laws governing security deposits and procedures for returning them. Make sure you understand the rules in your state. Our goal is to return 100 percent of the security deposit to every one of our residents. Stop in and talk to a member of our on-site management team if you have any questions and concerns about security deposits or any other part of your lease.